Kitchen counter tops are judged on several factors including aesthetic appeal, price, resistance to stains, impacts and scratches, and their ability to tolerate the heat from hot pots and pans without marring the surface. Some materials meet all these criteria, while others fail in certain categories, including heat endurance. 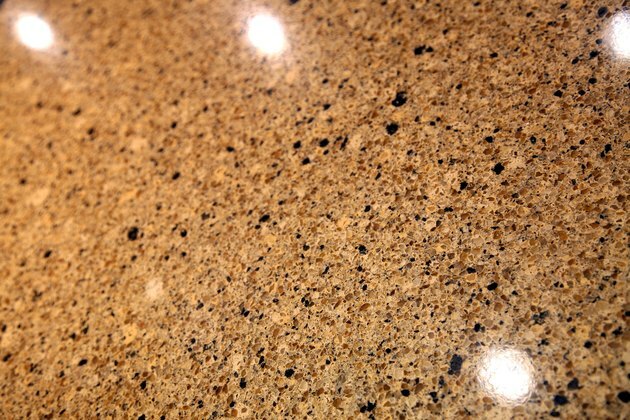 Granite is one of the most heat-tolerant counter top materials. Laminate counter tops have such low heat resistance that a cup of hot coffee can make them discolor or crack. Solid-surface counter top materials, typically made from layers of fused acrylic, are a bit more heat-resistant but are easily damaged by hot pots and pans and will even crack when exposed to extremely cold objects. Engineered-stone counter tops, made from quartz combined with other stones, vary in heat resistance by manufacturer. Granite is one of the most heat-tolerant counter top materials, mainly because its natural formation depends on extraordinarily high temperatures combined with very high pressure. A pan can be taken from the hottest oven and placed on a granite counter top without leaving any marks or stains. Quartz is highly resistant to scorching but not as resistant to harm as granite. Other natural stones such as marble, soapstone, slate and limestone have moderate resistance to heat, so trivets or hot pads are recommended for use under pots just removed from stove tops or ovens. These materials are as durable as granite in every way except heat tolerance. While they can withstand some degree of heat, they're prone to glazing or cracking if extremely hot pots are placed on their surfaces, and are sensitive to sudden fluctuations between hot and cold. The particular heat resistance of recycled glass is highly dependent on the types of glass used in the recycling process. Counter tops made from these metals can withstand a great deal of heat. Although the heat may cause discoloration, this can usually be buffed out with mild abrasives or special metal-cleaning solutions. Metal counter tops also retain heat more than other types do, so care must be taken to not place cold foods on them while warm, because this could promote the growth of harmful bacteria. Poured-concrete counter tops are highly resistant to high temperatures, so hot pots and pans can be placed on them without any chance of damage. Tiles made from ceramic or porcelain typically won't crack from heat but may suffer discoloration. Butcher-block counter tops are only mildly resistant to hot pans and will show burn marks if extremely hot cookware or bakeware is placed on them. Can Quartz Countertops Withstand Hot Pots? What Are the Causes of Cracks in Granite Countertops? Are Ceramic Tiles Heat Proof?